I was supposed to cook salmon for dinner, but.... was out of ideas. I was on Facebook and asked my fellow reader friends for ideas... lots came flowing in, but some can't be done due to absence of ingredient in my pantry. 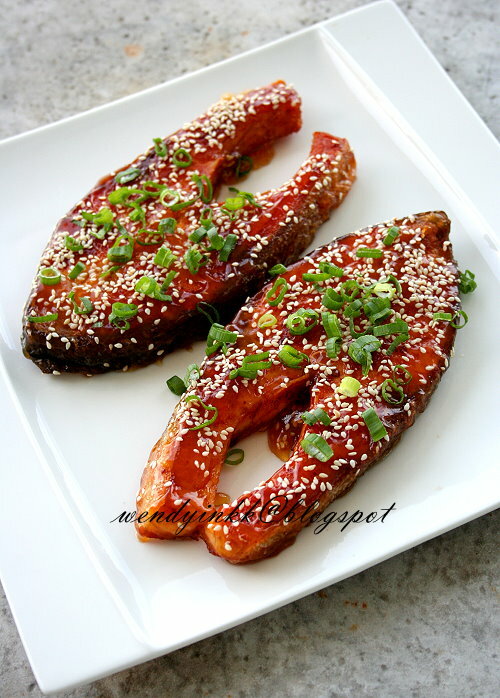 I also searched the web for pictures to inspire me and finally I saw one that looked interesting and that spurred me to try using sour plum sauce for the same visual effect. Actually I don't know what ingredients did that picture use, LOL. I was just taken by the physical appeal of it. I'm happy with this glaze and I think it will work well with other fishes too, or probably chicken or ribs. The ingredients are simple and it's easy to execute. For those of you who have dinned in Petite Millie, One Utama, you would have heard of White Truffle Oil Fish Pie. It comes with a loose crust made of puff pastry. 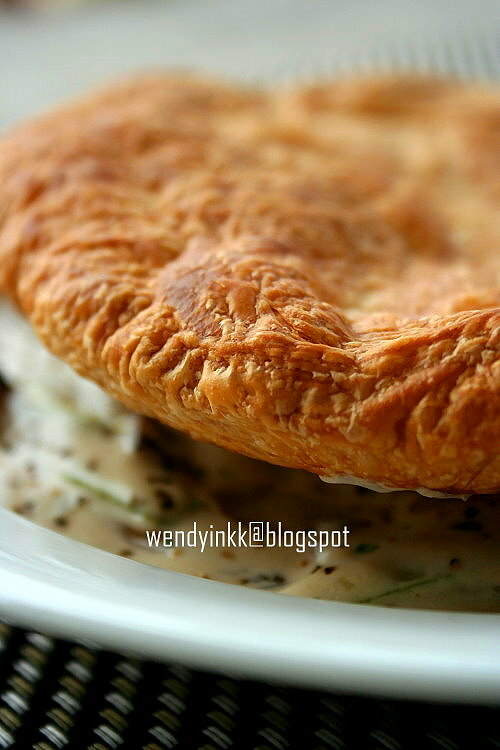 In the pie, are pieces of white fish swimming in a pool of creamy gravy together with shitake mushrooms and fennel. After having this once, I then decided to have my own version of this, borrowing the concept from Petit Millie. Sometimes I can be rather stingy to use the oven. Are you like me too? 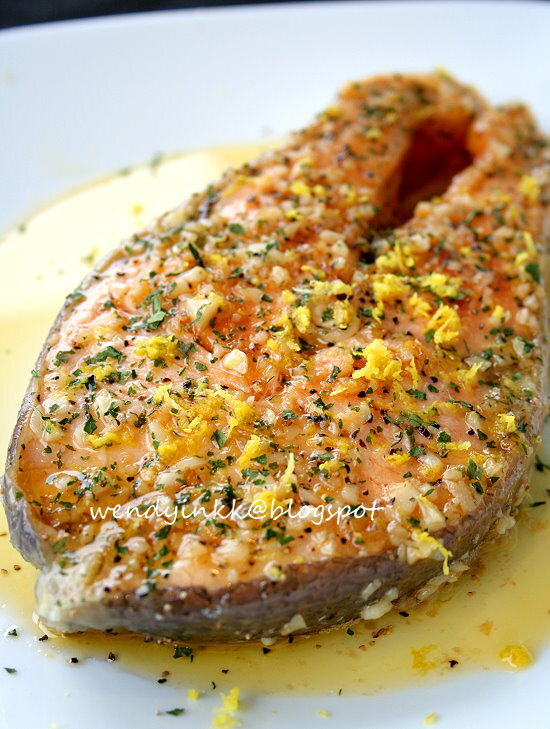 I made this using a pan on the stove, giving the fish the “feeling” of being baked. I won’t call it frying, as I used low heat with the lid on, ‘sauna-ing’ the salmon until it is tender and flakes when tested with a fork. The heat is not enough to make it golden, maybe just slightly browned, just like being baked. It tasted juicy and tender, as if it’s baked not fried, and the butter in here is more for flavouring purpose rather for browning. The garlic is soft and fragrant, still with some pungency rather than golden and crispy. Just how I intended it to be. I baked this cake twice. the first time, my custard sank and batter rose to the top, creating a very funny looking cake that sunk. The second time, I chilled the custard filling as a whole piece so that I can apply equal pressure to the base batter. The result was way better. I made this almost 3 years ago and never got to post it until now with the first rhubarb that I bought in 2010. That time, I was screaming in my heart when I saw rhubarb in Jaya Grocer for the first time. 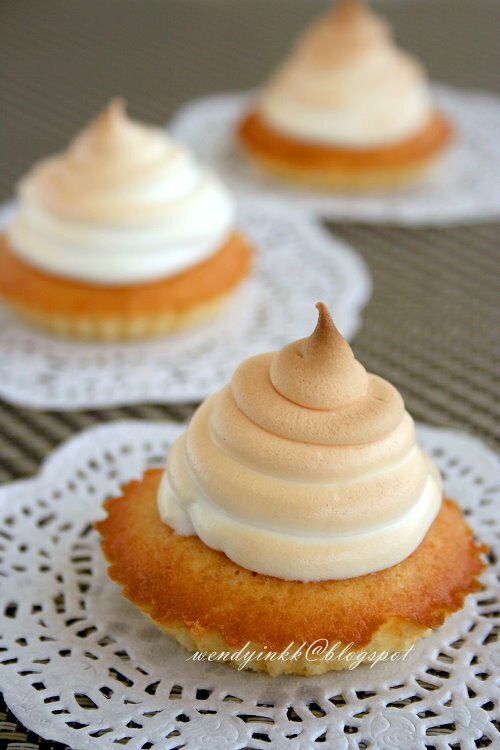 This is another recipe that I have been eyeing since I was a teen. 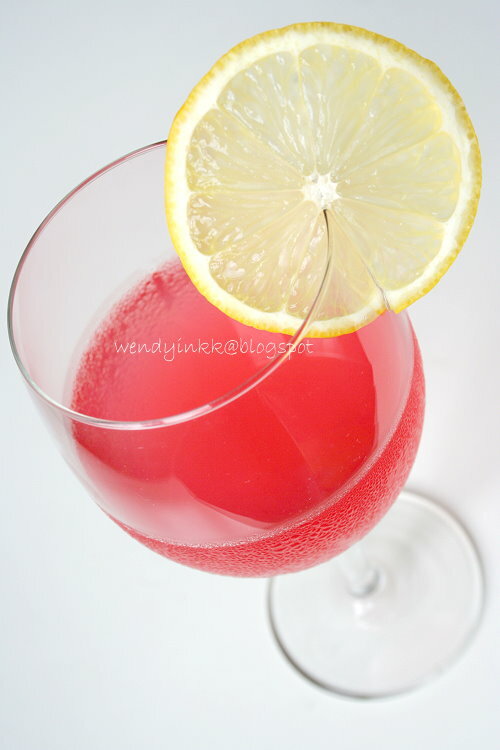 My aunt gave me a recipe book and I didn't know what rhubarb was and this drink looked pink. Really no idea what it is or how it tasted like. 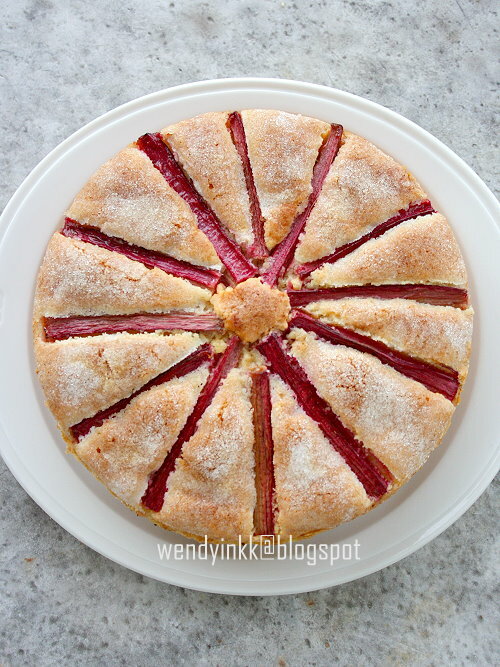 When I got my first rhubarbs, this age old recipe was definitely in my list to try. I have been waiting for years that one day I will have enough for a week's posting. LOL. Rhubarb is sooo expensive here that just 3 pcs of foot long stalks costs me around RM10. I'm blessed to have an aunt who will now bring back rhubarb for me from Australia, and she just planted some few months back, gleefully telling me she'll harvest them before flying back each time, if there are. 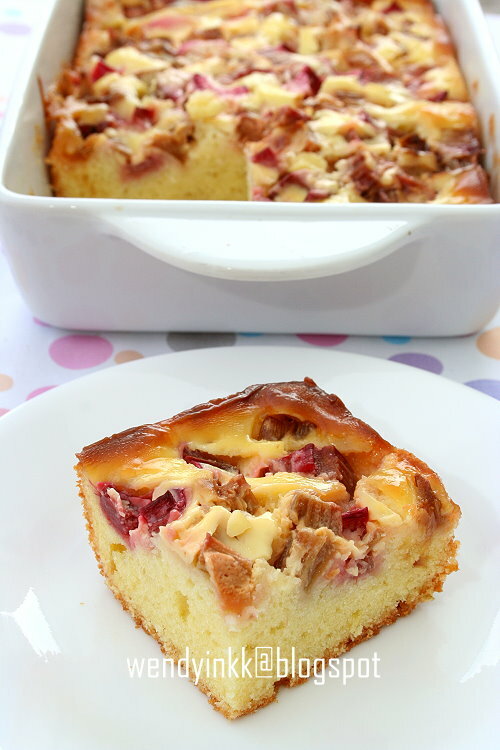 So most probably, I'll have more rhubarb recipes in my blog. I got to know about this noodle from my friend, Soo who came from Tawau. And I quickly searched for an image to help me understand the noodle. See the picture here. Then Soo, described to me how the taste and texture should be. Fried bananas are well loved and found everywhere here! 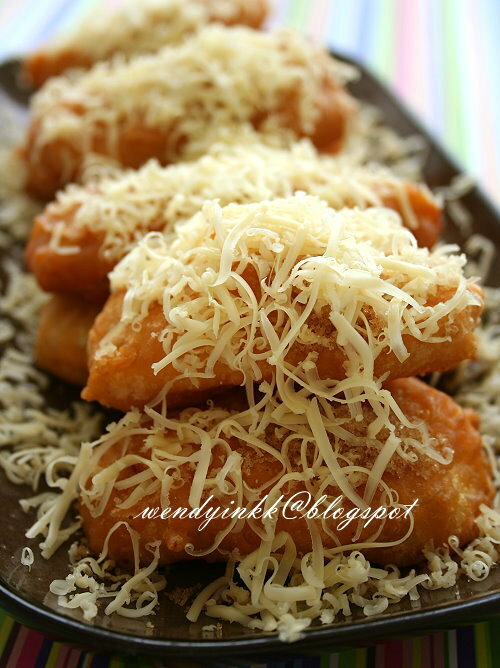 But in Tawau, the eateries there love to serve this version with cheese and brown sugar. You can use any batter recipe that you like, any type of bananas that you like, but you must serve it with brown sugar and grated cheddar. The Semporna Islands off Tawau are flourishing with seaweed farms. The cultivated seaweed is sold either in fresh or dried form with only the dried form out of state. Coral seaweed is also fondly called Sea Bird's Nest as they are also rich in collagen, the protein responsible for beautiful taut skin. The seaweed has no taste on its own, but readily takes on any flavour it is being infused with. I'm not trying to be disgusting.... but don't you think they do look like it? I grew up in an area where I do see cows walking around. They don't walk around freely, but are guided by their owners to feed at the field near my old house. Therefore..... the roads are also decorated with brown piles from the cows. It's no longer a common sight.. it makes me miss those days. 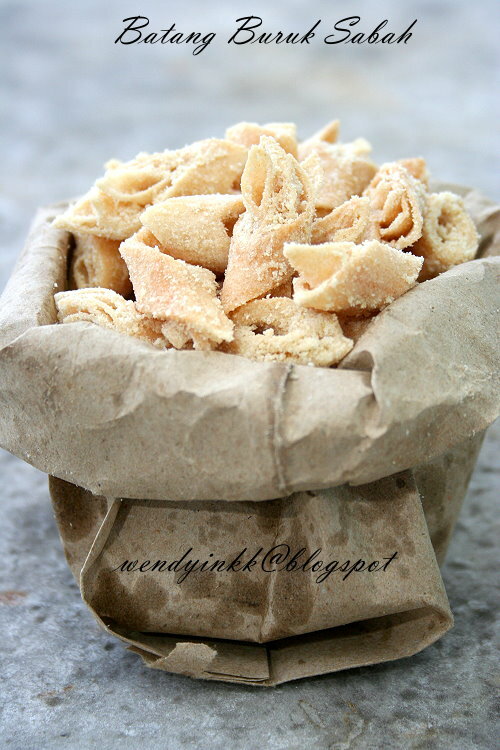 Crunchy addictive snacks from Sabah. 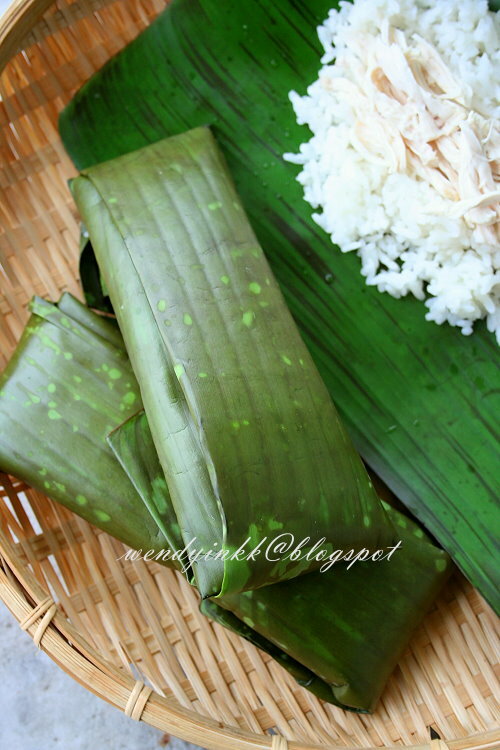 Batang buruk is also found in Johor and is one of Johor's specialties, but.... Sabah's version is a much simpler one. Using store bought spring roll wrappers, and allowing the use of dustings like powdered cereal,, milk powders or even malted powders, it is a easy to do snack that can be made in a jiffy. 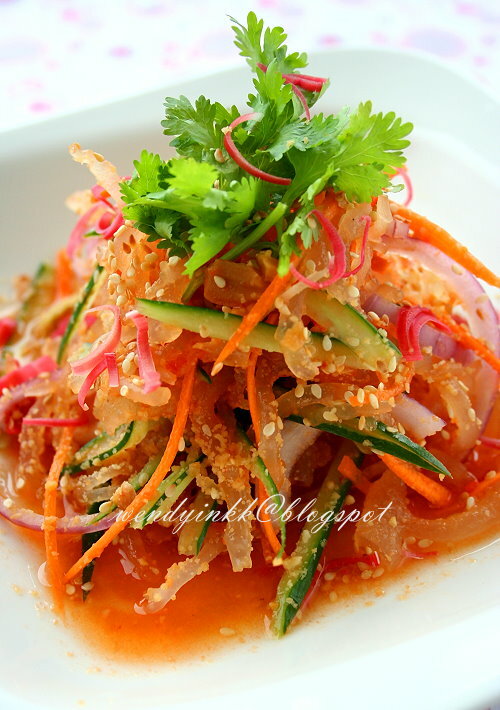 The Johor way that involved forming the crust in tube like shapes around papaya petioles requires more work and later stuffed with fillings instead of just dusting. I made this using leftover spring roll wrappers from Chinese New Year and also milk powder samples, LOL. When I first saw this recipe.... I asked myself, how nice can this be? Then as I think about it, I remembered how my mom used to put steamed chicken juices onto our rice, and it was heavenly. No fancy seasoning, and the chicken was only rubbed with some salt and steamed. Now... I roughly know what it tastes like. 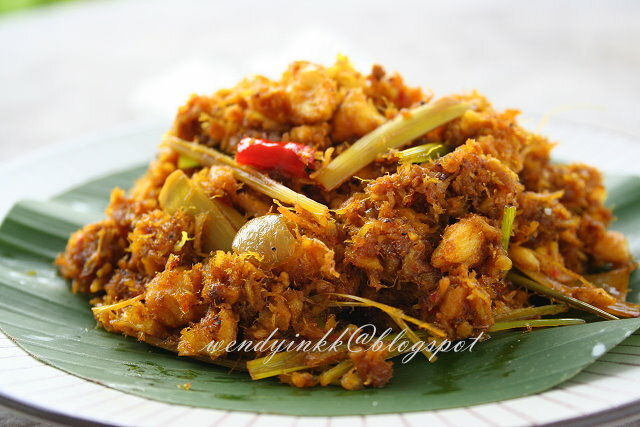 Sinagol is a Bajau dish. It's shark and shark liver cooked with turmeric. It can also be can also be cooked with another pelagic fish, that is the sting ray (called Sagol Pari instead) or even puffer fish, surprisingly. The Bajaus are traditionally from the Sulu Archipelago and they are currently the 2nd largest ethnic group in Sabah. The east coast bajaus are also known as the sea gypsies. They are also noted for their exceptional abilities in free-diving, with physical adaptations that enable them to see better and dive longer underwater. The west coast Bajaus are also known as good horsemen. I do remember learning about their horse riding while I was a kid in school, probably in primary school. This month's MFF is featuring Sabah, the Land Beneath the Wind. The only state in Malaysia that I have never set foot in, not even for a minute. I'm quite vague about it's cuisine as there aren't much recipes available on the internet. Some of which that you will see me posting this month, is recreated from descriptions of taste and pictures found on the internet. I do hope that it is close to how it should be. And I'll be featuring the traditional dishes before I move to the modern day yums of the state next week. Probably 8 recipes in total. Back to Ambuyat. I first got to know of this dish via Disney Junior channel. It was rather intriguing... how does bland starch taste like. 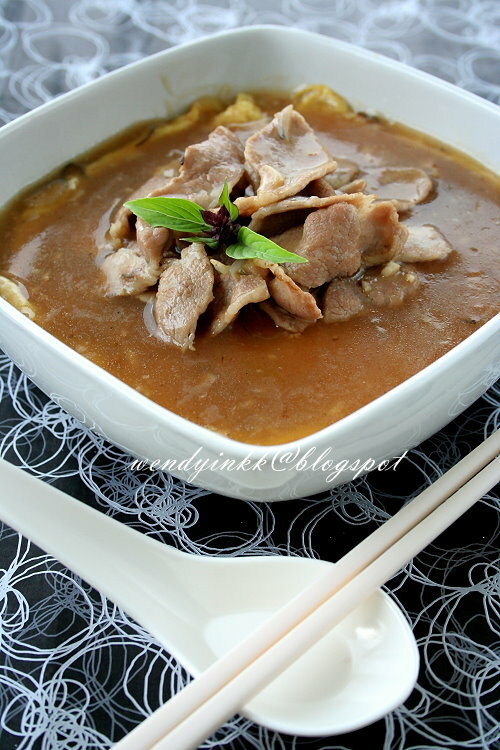 Ambuyat is a dish of the Bisaya people that reside in Brunei as well as both Sarawak and Sabah. 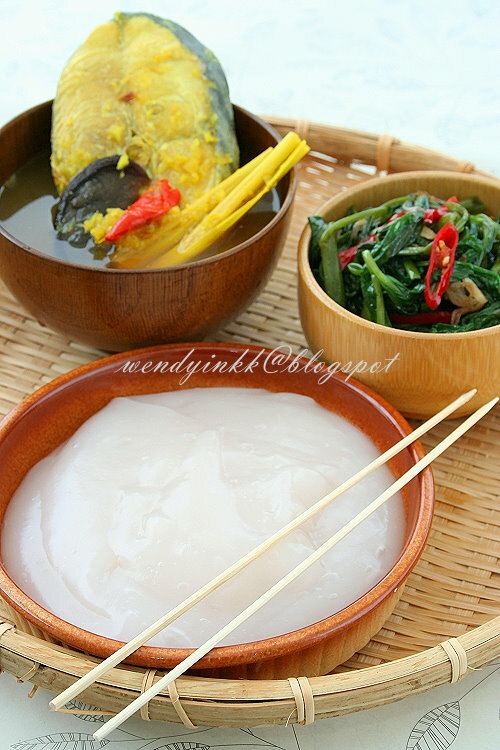 Other tribes do consume ambuyat too, and it may be called with other names like 'linut' or 'jalit' in Miri. It is eaten like a staple, like how one would eat rice, or bread or noodles. It is made from sago starch, derived from the trunk of the sago palm. The starch is soaked and cooked by scalding it with boiling water. Ambuyat tastes bland, and is always served with dishes, like how rice is served, and the dishes usually comes with a hot and sour tone. And to eat ambuyat, one uses sticks, not hands nor other cutleries. Some will use chopstick to twirl the starch. I couldn't twirl the starch that well, as they aren't as sticky as seem on TV. Maybe it's because mine aren't the ones harvested from Borneo. It is said that the sago starch we have here is not the same as the ones there. But after dipping in the sour gravy.... it becomes one lump of slithery goodness...that I find it quite similar to eating jelly. I don't know how I should eat the vegetable condiment and so I lifted some up to be chewed along. Eating ambuyat is pleasurable and fun! Bring 400 ml water to a boil (the water will evaporate as you boil). Mix sago starch with drinking water. Stir it well, the starch might be a bit hard to mix around. Pour boiling water, going slow and stir all the time for the earlier moments, then continue to pour the boiling water until you can notice some parts are turning translucent. Stop pouring and stir vigorously to form a soft sticky translucent lump of cooked starch. *Zap in microwave if your ambuyat fails to cook even if you have added all of the boiling water. 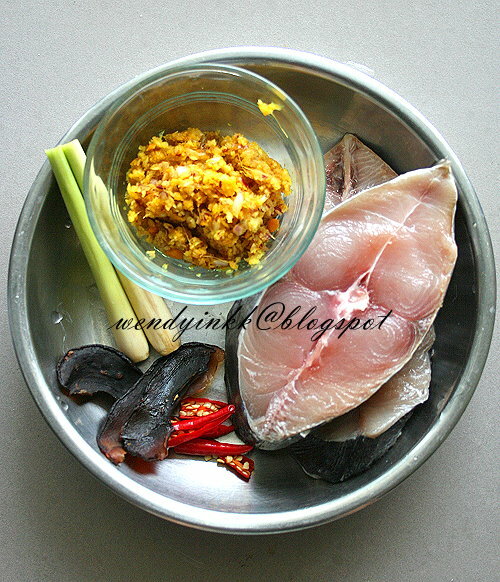 Put everything into the wok/pot except the fish and salt and bring to a boil. Lower to a simmer for 10 minutes, then put in the fish. Let it simmer until the fish is cooked. Add salt, and make it slightly oversalted. Trim kangkung and rinse them well to get rid of sand. Slice shallot, garlic and chilli. Chop belacan finely. Heat wok and put in oil. Saute shallot and garlic until fragrant, add in chilli and saute until the shallots look slightly golden. 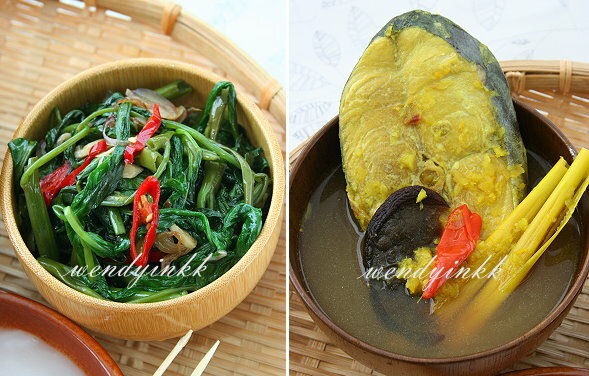 Put in chopped belacan and cook until very fragrant. Put in kangkung. Gently toss them around. Cook until just wilted. Dish up.